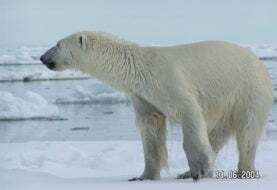 excerpt " .... Polar bears (Ursus maritimus) got a long-awaited boost on November 23 when the U.S. Fish and Wildlife Service (FWS) finally designated more than 485.000 kilometers of critical habitat for the The critical habitat—95 percent of which is sea ice—includes barrier islands and onshore areas where mothers den their young, along with offshore sea ice. It doesn't do a huge amount to protect polar bears species , but it does require federal agencies operating in the area to "ensure their actions...do not harm polar bear populations." A Warming Climate Takes its Toll on the Polar Bears of Hudson Bay. from Daniel J. Cox on Vimeo. This video contains graphic material that may be extremely disturbing to some people. However, this is real life for polar bears due to the harsh environment they live in. This film shows a mother and her two cubs who were all obviously malnourished. The two cubs eventually die, most likely due to starvation. These animals were part of the Western Hudson Bay population that spend several months on land each year due to melting ice. The time they spend on land is increasing due to the changing climate in the arctic. This film is part of The Arctic Documentary Project spearheaded by Daniel J. Cox under the umbrella of Polar Bears International. pinning it to the ground..
A Successful bear rescue ..
as the net finally came off and released the little black bear cub baby .. phew ..
" ... OYSTERVILLE – Is Monte Miller – the man state officials accuse of causing the largest bear removal case in state history – a nature lover or a menace? he bears would eat about 150 pounds of dog food a week, which averaged to $4,000 a year, he said. Soon, other residents started coming by to watch the feedings on Miller’s heavily wooded lot. They’d bring children and out-of-town relatives and take pictures, he said.